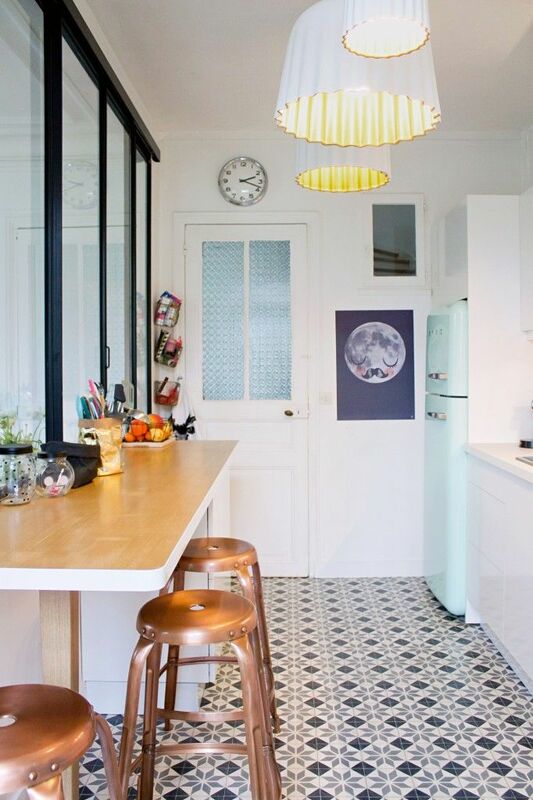 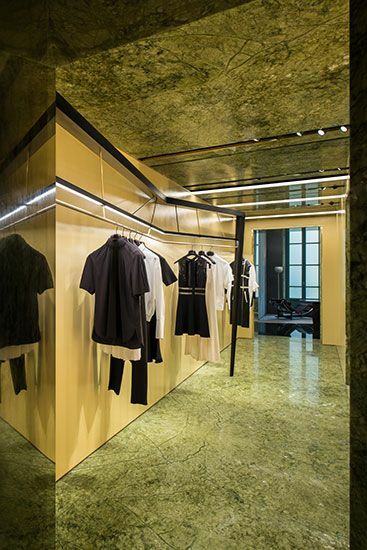 In contrast to the darkly atmospheric main spaces, a brighter mood prevails in the store’s corridors where Ming green marble lines the floors and ceilings, and walls are painted in a glossy yellow. 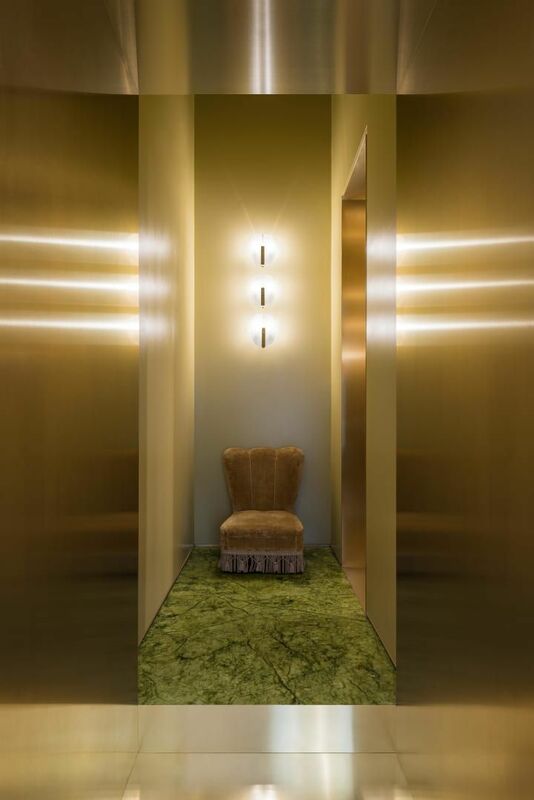 Here a brushed steel staircase connects the ground and first levels illuminated by lamps that were custom designed for the space. 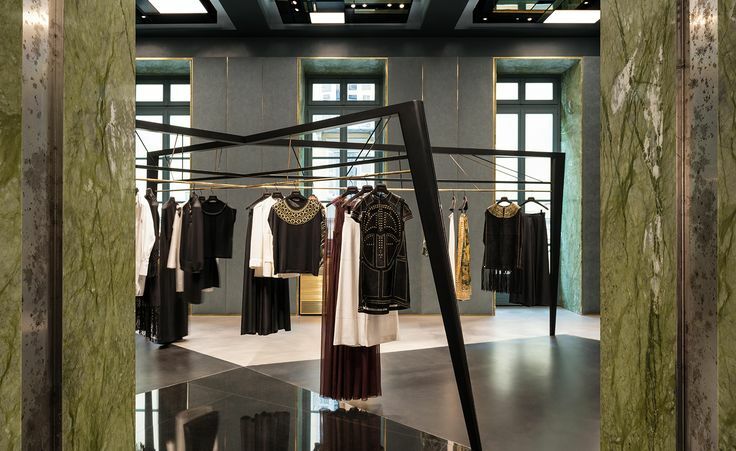 Snaking across the shop floor is a maze of custom made display rails made from black-painted iron and stainless steel that display creations from every major fashion house under the sun. 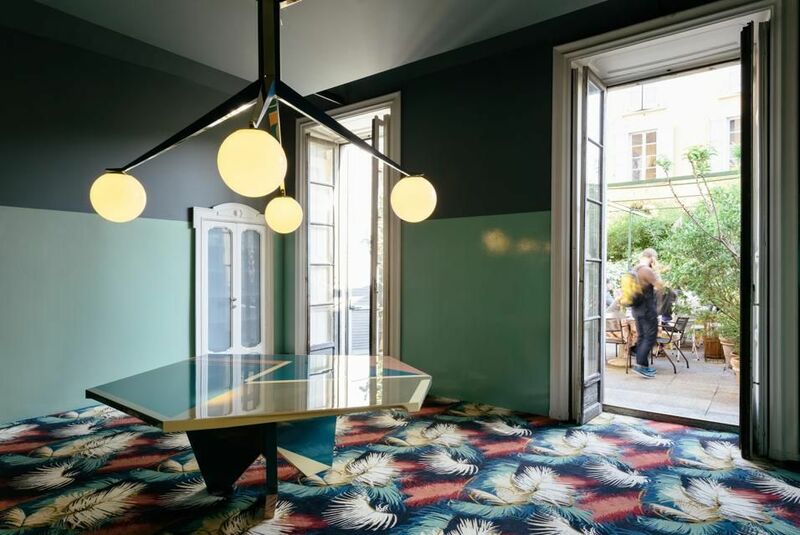 These sculptural beasts, the designers say, were inspired by the works of American artist Oscar Tuazon, and as well as Louise Bourgeois’ monumental ‘spiders’. 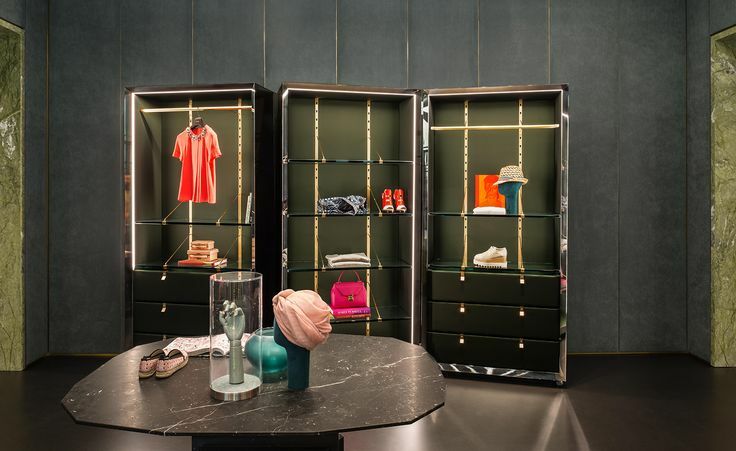 In order to showcase smaller items and accessories the Milanese duo commissioned a series bronze clad trunk containers – another reference to the 1920s and 1930s – which are opened up around the store to reveal silk-lined interiors equipped with shelves and small hanger rails. 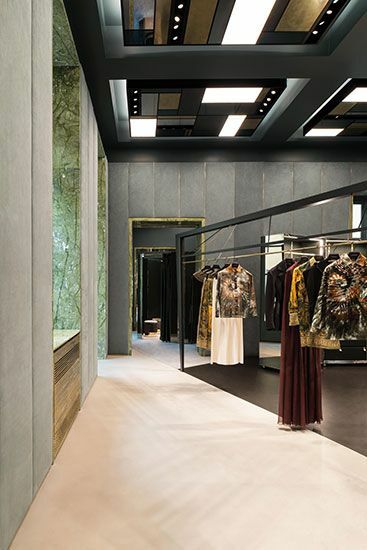 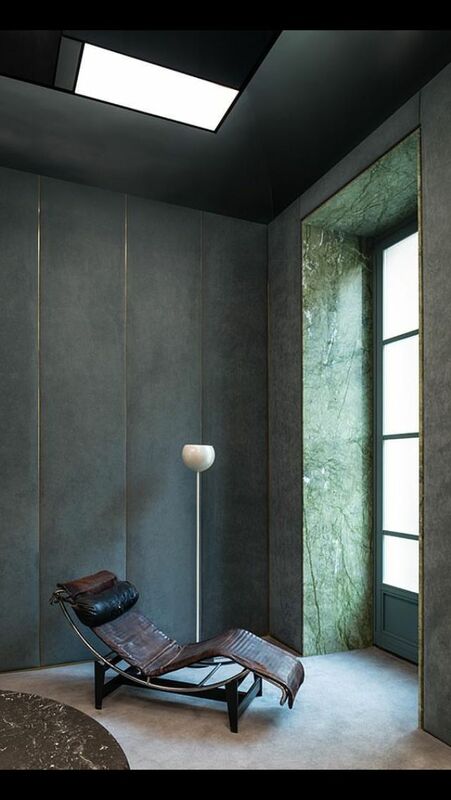 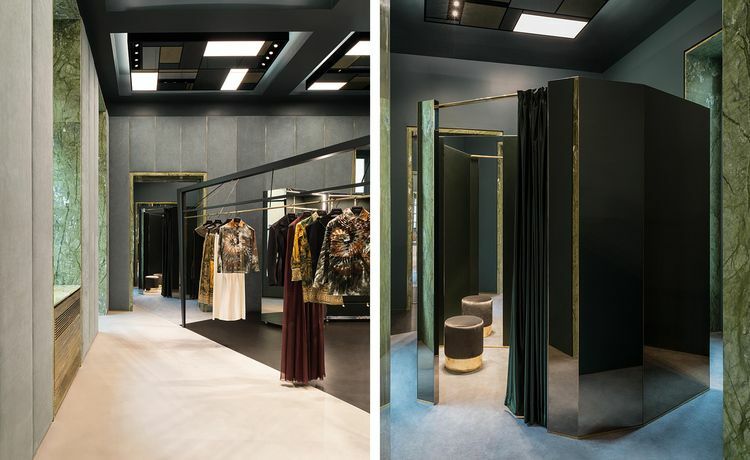 Floor-to-ceiling brass-edged Alcantara panels line the walls, while the floor is divided up into angular sections of carpet, grey polished cement, black resin and black granite that define the store’s layout. 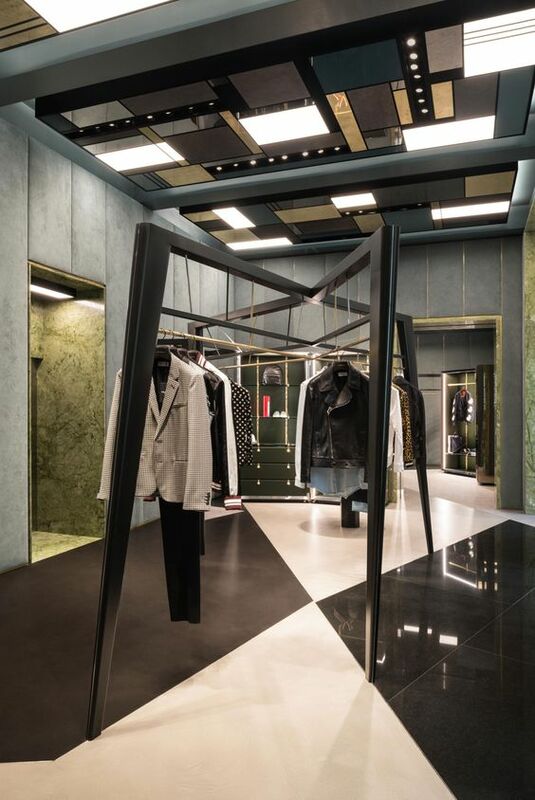 Overhead, a series of large abstract ceiling ‘chandeliers’ layer geometric shapes that reference the building’s grandiose architecture. 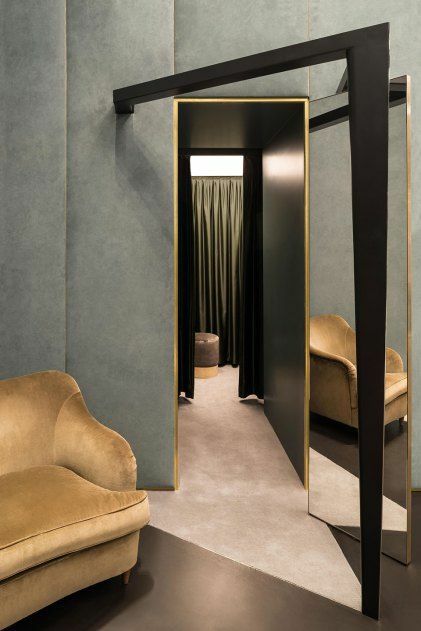 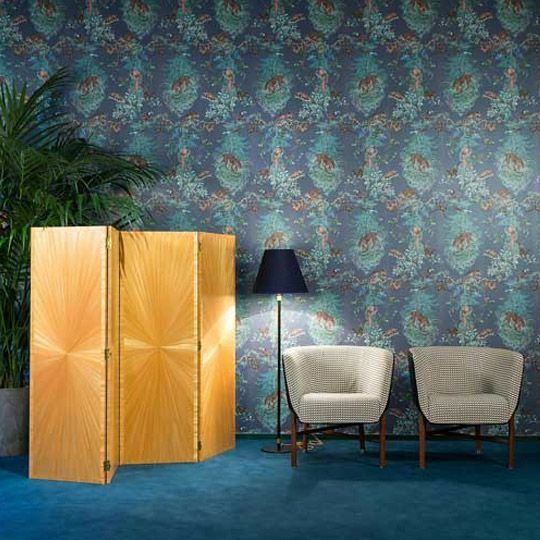 Dimore Studio, the Milanese interior designers led by Britt Moran and Emiliano Salci, are much in demand with fashion’s finest. 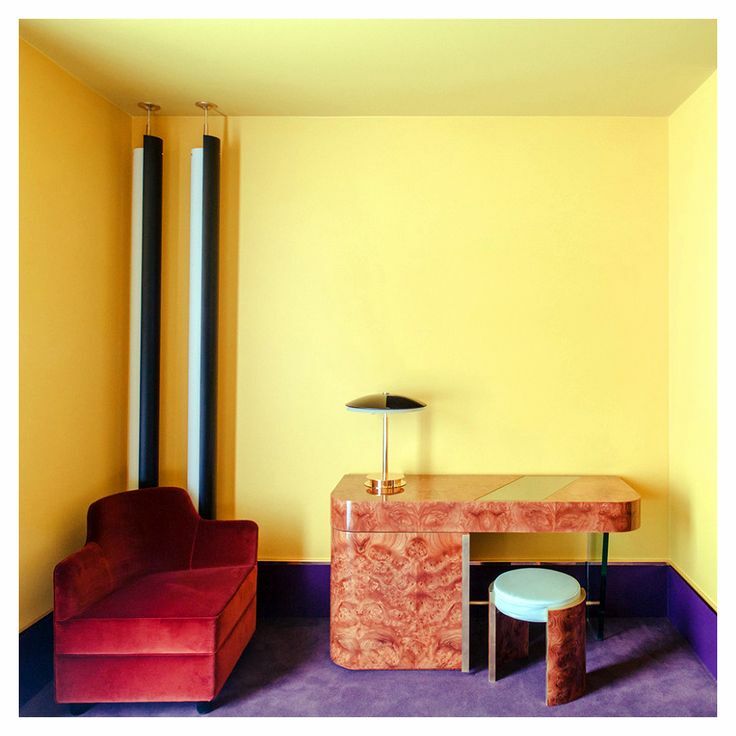 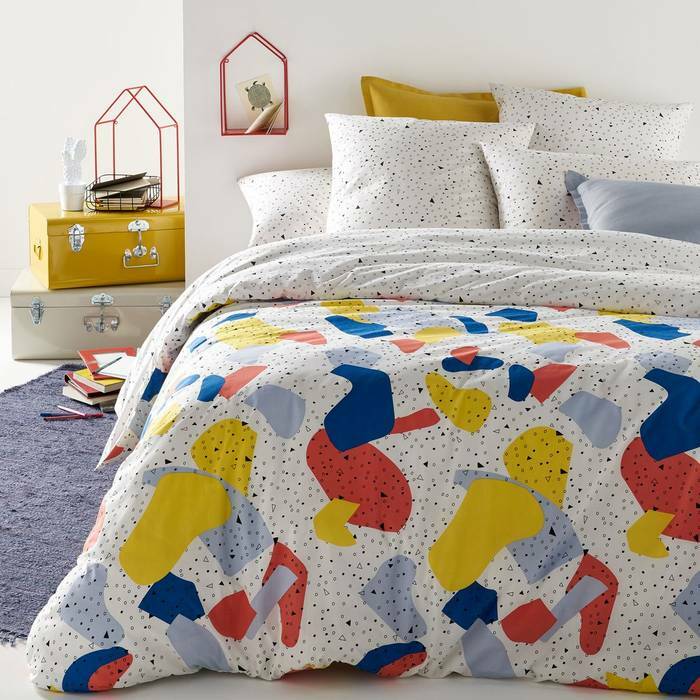 Their ability to harmoniously fuse the past and present into one timeless package has seen them create interiors for everyone from Hermès to Maison Kitsune. 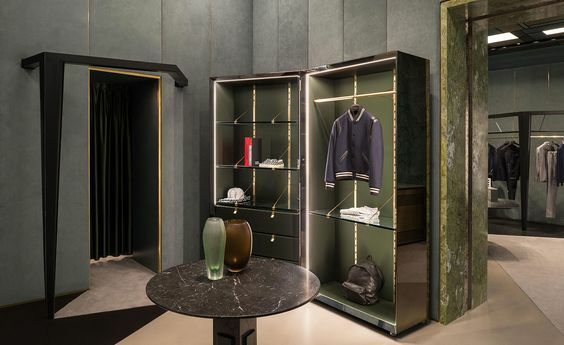 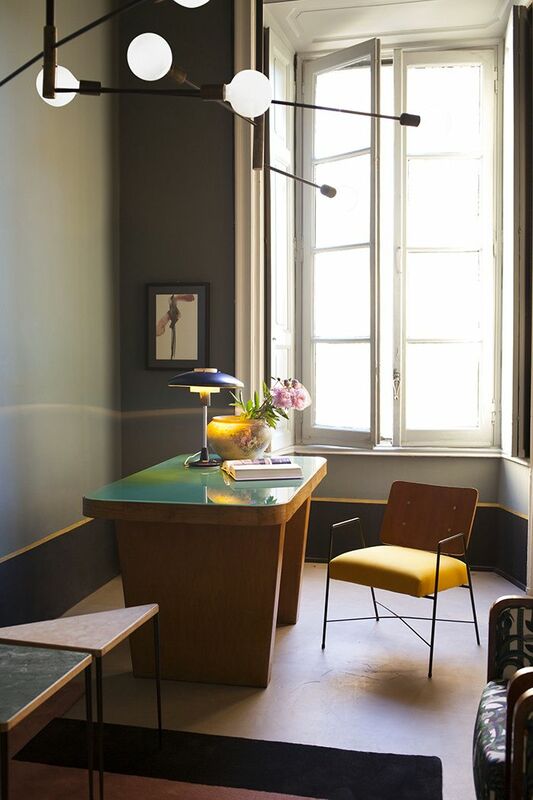 Joining their client list this month is Lagrange12, a new luxury multi-brand boutique housed in a 17th century Palazzi in the centre of Turin.